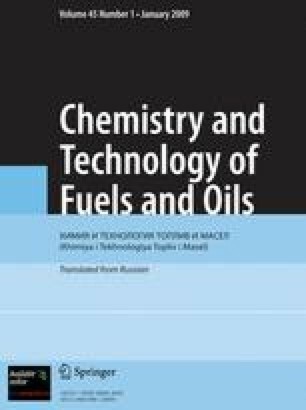 The extensive utilization of deposits of highly viscous crude oils is stimulating a wider investigation of the physicochemical processes involving macromolecular resins and asphaltenes (RA). The reliability of operation of turbolines in pumping crude oils with a high solid point is determined to a significant degree by the possibility of controlling the flow of liquid colloidal systems whose disperse phase is primarily represented by asphaltenes. However, there is no sufficiently complete information on cross-linking mechanisms involving molecules of RA and the degree of the effect of the structures formed on the rheology of the liquids for such control. We used viscometry to investigate the characteristics of association and dispersion of RA in relatively simple model liquid media. The effect of the concentration composition of liquid media were previously primarily investigated in such studies [1 – 3]. The step for changing the temperature was too high: 10°C and higher, to determine any thermal characteristics of viscous flow. Translated fromKhimiya i Tekhnologiya Topliv i Masel, No. 6, pp. 32 – 34, November – December, 1999.